Alexandria Ocasio-Cortez is a Justice Democrat, and one of us. She is running for Congress to be a champion of the people, not to represent the corporate wing of the Democratic Party. She will restore democratic functions to Queens civic bodies and end the machine-like control of the County party boss. On June 26, vote for Ocasio. Defending Public Housing. Ocasio-Cortez will fight to protect and to expand public housing in New York City. She will find the money to make much needed improvements and repairs to public housing. She will stop the conversion of public housing to Section 8 housing that is being used as a backdoor to privatization. Ocasio-Cortez will also fight to end any form of discrimination against public housing tenants, such as making sure that permanent exclusion is ended. Stopping Gentrification. As a parent and the product of a working family, Ocasio-Cortez feels the pinch that New Yorkers experience in the pocketbook due to escalating rents, gentrification, and displacement of communities. Ocasio-Cortez showed up for the comunity in Elmhurst to protest the construction of a 13-story tower with a big-box store (a “Target“) in its commercial space. Ocasio-Cortez knows that unregulated real estate development, including the relentless construction of luxuyr housing, is the source of escalating rents in New York. If elected, Ocasio-Cortez will use her position within the Queens Democratic Party county committee to elect officials, who will end the non-stop gentrification of Queens. Reforming the Queens Democratic Party. It has been reported that, in the lead-up to when U.S. Rep. Joseph Crowley (Establishment-NY) installed the real estate industry ally Corey Johnson as speaker of the New York City Council, the Queens Democratic Party county committee was accepting political donations from powerful real estate development firms, such as Rudin Management Company, which is headed by William Rudin, who is now chair of the Real Estate Board of New York (“REBNY”) ; BFC Partners, which was co-founded by Donald Capoccia, who was able to walk away with controversial development rights over the Bedford-Union Armory in Brooklyn ; and the Brodsky Organization, a real estate develoment company whose leadership includes Daniel, Alexander, and Thomas Brodsky, who were spearately campaign contributors to Speaker Johnson’s 2017 committee to reëlect. 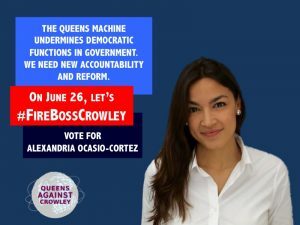 Were Ocasio-Cortez to defeat Crowley, she could be counted on not accepting corporate money to the Queens Democratic Party county committee. Returning Democracy to Queens. Ocasio-Cortez will make reforming the Queens Democratic Party county committee a priority. She will see to it that participation, meetings, and the selection of leadership for the county committee is opened up to the public. 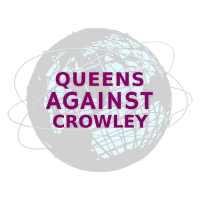 Ocasio-Cortez’s commitment to transparency will end the undemocratic stronghold that Crowley has used to have his way with Queens politics. Because Ocasio-Cortez will represent the people, she pledges to address the income and wealth inequalities that are making New York City a land of haves and have nots. She will take her sensibility of being a working New York City parent and fight for social, economic, and legal policies that will promote a living wage, job guarantees, and union protections. For longer than Crowley has been in Congress, Richard Brown has been the District Attorney of Queens County. During this time, corruption scandal after corruption scandal has engulfed the careers of several Queens politicians. Separately, the whistleblower Adrian Schoolscraft was kidnapped and held against his will by police officers in Jamaica Hospital. The Occupy Wall Street, the Black Lives Matter, the Close Rikers, and the immigration justice social movements have focused on the need for ciminal justice system reform. And all the while, the Queens D.A. has resisted calls for reform. Because Brown runs for office with the express support of the Queens Democratic Party county committee, he has not answered to the public calls for ciminal justice system reform. Why should he, when his brand of race-based prosecution is enabled by Crowley ? When you elect Ocasio-Cortez, she will make sure that there is a healthy — and long over-due — primary race for Queens D.A. Criminal justice system reform is being embraced in Brooklyn and, to some extent, in Manhattan. 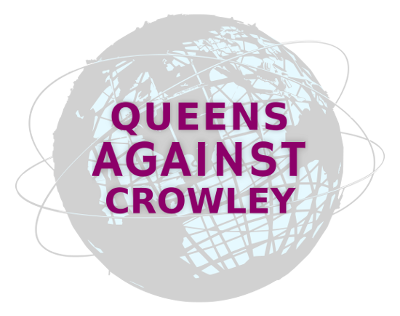 But Queens resists, because that is what Crowley wants. Immigration Justice. Once Ocasio-Cortez brings new leadership to Queens, she will also push the Queens D.A. to stand up to Immigration and Customs Enforcement officers, who are being allowed to entrap New Yorkers in the Queens County courts. This silent complicity or collaboration by the Queens D.A. must come to an end. In Ocasio-Cortez, voters will be able to count on a leader of the Queens Democrats, who will not enable politicians, who, in turn, keep Republicans in power up in Albany in a political arrangement that undercuts the expansion of equal rights for women. Ocasio-Cortez believes in finally achieving equal pay for women. She also will continue the fight to end gender discrimination. She will defend against any attempt at rolling back civil rights by Republicans. Ocasio-Cortez has gone on the record to champion a single-payer healthcare system for the United States. As a member of the U.S. Congress, if elected, she will support and vote for legislation to make sure that everybody receives healthcare coverage regardless of income or occupation.